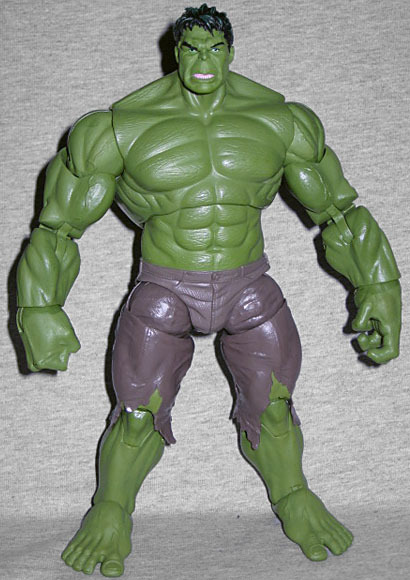 We already reviewed one movie Hulk, but that was just a placeholder figure: looking at the first crummy photos of the Walmart-exclusive Hulk, I didn't think he was cool enough, so the Marvel Select version was the stand-in. And yet, here we are. The world seen through the eyes of the Hulk is distorted with rage, a haze of violence like a bad dream. Trapped within the mighty frame of the Hulk, Bruce Banner is barely able to maintain control. And yet, the Hulk is a hero. His immense strength is always turned to the protection of the weak, and the defense of justice. For while the Hulk may be rage incarnate, it is rage that is always properly directed against those hoping to cause harm. Contrary to what I thought, Hulk is big and awesome. He's an even 8" tall, which is half an inch smaller than he should be if we're to believe the animators' assertation that the character in the movie stood 8'6", but it's still enough to make him look nice and tall next to other 6"-scale heroes and villains. And he's not just tall, either: he's wide, which a lot of Hulks get right, but he's also thick, which many of them get wrong. Sure, he's 3¾" across the shoulders, but he's also about 2" from front to back. That means he's physically imposing from all angles, a very important feature that is often overlooked, even on big guys like this (probably because it's an easy way to save some money that won't really be noticed). The sculpt is great, as well. 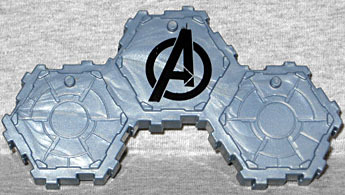 It's more stylized than the Marvel Select figure, but also has more texture. He still has prominent veins running up his arms, but his skin has faint cracks all over. It sort of makes him look leathery, but also suggests that it's stretched nearly to the breaking point. His pants are better, too. Remember how we complained that the MS version didn't have any sort of detail to make them look like cloth? That isn't repeated here. Again, it's a subtle level of sculpting, but it works. The likeness on the larger Hulk is good, but this one is superior. 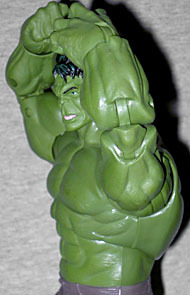 We have no idea who sculpted this figure, but the face has an unmistakable "Ruffalo-ness" to it. He's not as angry as his big brother, but he's still not a happy camper. We get to see his bottom teeth, and there's just a hint of a sneer that reveals a few teeth on the upper right. 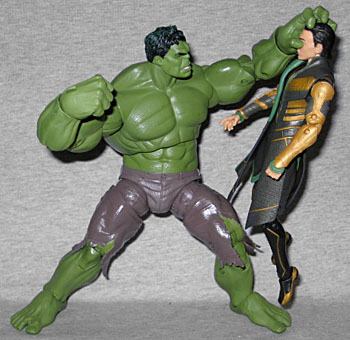 Hulk's green is rather muted, and he doesn't have any paint apps on his nails. There are some green streaks in his hair, but they only really show up under strong lighting (like a camera flash). He doesn't appear to have any washes or highlights to break up the green, but it's all painted, so he doesn't look plasticky. The pants have a purple tint, which is another point in the win column for this one. The articulation is as good as any other 6" Marvel figure. There's a large balljoint for the head, swivel/hinge shoulders, double-hinged elbows, swivel/hinge wrists, a balljointed torso, swivel/hinge hips, swivel thighs, double-hinged knees, and swivel/hinge ankles designed to work like rocker joints. Because of the thickness of his arms and the necessity of constructing a double-hinged elbow, the arms get noticable gaps right in the middle. We've seen similarly thick arms that didn't have this problem, so there must be something specific about the design of this Hulk that made it happen. On the plus side, his left hand is open slightly, making for more dynamic poses than two clenched fists would. The Marvel Select Hulk is a good figure, but ultimately it only fits into a 6" Marvel movie collection with some allowances. If you can't get this 6"er, it's a perfectly serviceable replacement, but if you can get this one, do. It's not just a good "movie Hulk," it's a good 6" Hulk, period. It'll be a good addition to any Marvel Legends collection.